Step 1. 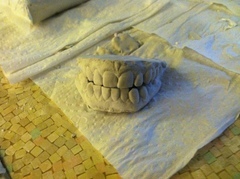 Make Algenate mold of my teeth. 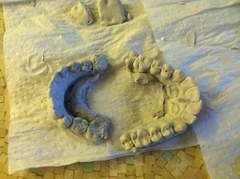 Mixed alginate 1 to 1 water to powder, about 1 oz for top and 1 oz for the bottoms. I made the tops easy enough, the bottoms needed to be thicker before I poured them, more time, but it worked. Step 2. 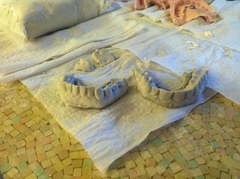 Make Casting of Teeth in Dental Stone. I mixed 2 to 1 water to powder 2 oz to 1 oz each and it was too watery. I saved to batch by adding more powder. I think the included instructions were wrong and backwards. I will make their bases next.